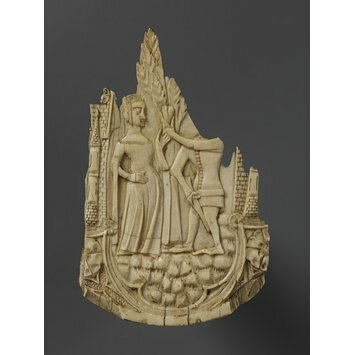 This fragment of an ivory mirror back was made in about 1380-90, probably in Northern Italy (Milan). It depicts a knight offering his heart to a lady. 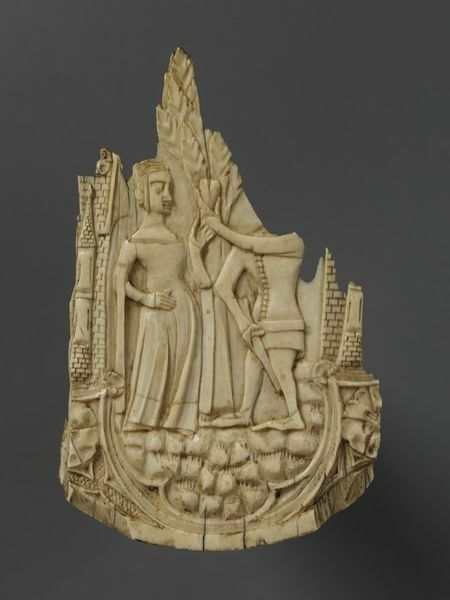 Fragment of a mirror back depicting a knight offering a heart to a lady in a garden flanked by buildings. The subjects is within a quatrefoil, the spandrils of which are filled with tracery and roses. He is wearing a belted and buttoned pourpoint with sword and the lady is dressed in a houppelande with long tippets hanging from the sleeves at the elbows; her hair is braided and netted. The walls of a palace or castle are shown at each side and the figures are separated by a tree which grows oput of rocky ground. Given by Sydney Vacher, Oxted, Surrey, in 1920; previous history not known.